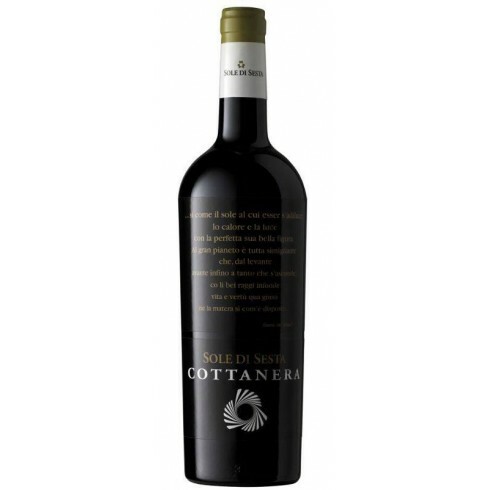 Sole di Sesta DOC Sicilia Syrah – Cottanera - On Offer | Saporidoc UK. The arrangement we have with our shipper ensures that the more you buy the lower the shipping cost will be per bottle, and also the shipping costs have discrete steps and change for every 10 kg (ca. 6-7 bottles), which means you can optimize the shipping cost by changing the number of bottles you buy – you can check this online in the Shopping-cart summary page. Sole di Sesta Syrah from top Etna producer Cottanera, a pioneering winemaker, one of the most extraordinary producers in Italian enology today. This is a wine made from grapes grown at high altitude, on rich, volcanic lands. It is an appealing red wine, full-bodied and well-balanced. Maturation Maturation 12 months in medium heavy toasted French oak barrels (45% new). Followed by 18 months ageing in the bottles. Bouquet Wide notes of sweet fruit, with fresh nuances of the Mediterranean blending well with hints of spice, such as chocolate and black pepper. Taste An appealing wine, fullbody, well-balanced, warm, solar, rich in noble tannins well supported by good acidity. Excellent, long persistent aftertaste. Pairs with Pasta dishes, pizza, tasty meat dishes and medium aged cheeses. Serve at 16-18 C.
The Cottonera production philosophy is to create an enterprise model which brings tradition and innovation together in the vineyards, as well as the winery. In the vineyards grapes are grown without an irrigation system and nearly all operations are carried out by hand. On the 65 hectares of vineyards both autochthonous and international varieties are grown. The land is unique and gives rise to an extreme diversity of vines. The vines for the Sole di Sesta red wine have an age of 18 years and grow at an altitude of 750 metres in Cottanera’s lavic soil vineyards in Contrada Cottanera and Contrada Feudo di Mezzo on the Northern slopes of Mount Etna near Castiglione di Sicilia. The grapes were harvested manually and carefully sorted. Following a gentle destemming and maceration on the skins for 20-25 days the fermentation was done at controlled temperature with constant pumping of must over grapes and wine-pressing followed by the malolactic fermentation in French oak barrels. The refining of the wine lasted 12 months in medium-heavy toasted French oak barrels (45% new), followed by 18 months ageing in the bottle. Quota 1000 Contrada Barbabecchi is the top wine from the famous Graci Winery. A prestigious and powerful organic red wine made primarily from Nero Mascalese grapes from vines that grow above 1000 m. on Mount Etna. Rosso del Conte is a captivating single vineyard wine from Tasca d'Almerita’s Tenuta Regaleali estate in the Palermo province. It is made mainly from Perricone and Nero d’Avola grapes and expresses the quality and longevity characteristics of the Regaleali Estate. Rosso di Montalcino from the very famous House of Castello Banfi in Toscana. An estate that is recognized for its unique wine culture and tradition. This Rosso is able to match the elegance and solidity of the Brunello with a freshness and directness that make it a very versatile wine. RossoJbleo from Sicilian top producer Gulfi. An easy drinkable organic Nero d’Avola wine, whose body and aromatic complexity exceed the acquired expectations for such a price. An entry-level Nero d’Avola, yet capable of delivering authentic varietal character and the bold signature of the Sicilian terroir. 2012 Saia from the recognized Sicilian producer Feudo Maccari. A beautiful fruity red wine made from Nero d’Avola grapes, a grape capable of producing intense, full-bodied wines. The alberello method of cultivation and the ageing in French oak make this one of the best in its category. 2010 Santa Cecilia from the innovative Sicilian top producer Planeta. Santa Cecilia is the top Nero d’Avola wine from Planeta and is an expression of elegance, power, balance and eminence of the unique aromas of Sicily, and today this wine is the benchmark for red wines produced from Nero d’Avola. 2012 Santagostino Baglio Sorìa Rosso from top producer Firrato. A quintessentially Sicilian red wine that has seduced wine lovers the world over with its pleasing complexity and its perfect balance between freshness and alcohol content. Sedàra from Sicilian top producer Donnafugata. A young wine made primarily from autochthonous grapes. A modern wine that has an immediate pleasantness. It offers a fruity and pleasantly spicy bouquet - a glass of quality wine, perfect for everyday drinking. 2012 Siccagno - Top wine from young and famous upcoming Sicilian producer Arianna Occhipinti. A beautiful organic Nero d’ Avola wine - fresh, elegant and red fruit flavoured. SP 68 Rosso – An organic wine from young and famous upcoming Sicilian producer Arianna Occhipinti. Cool and pleasant, with a delicate taste that brings the flavour of the sun and the freshness of this land. The Syrah is a beatiful everyday red wine from Sicilian top producer Cusumano - fruity, warm and rich made from Syrah grapes grown in western Sicily. Maroccoli Syrah from the innovative Sicilian top producer Planeta. Maroccoli is the top Syrah wine from Planeta and is an expression of elegance, power, balance and eminence of the unique aromas of Sicily. This version of Syrah is produced in a modern style, respecting all the characteristics of the vine. 2015 Tareni Nero d'Avola from the famous Sicilian House of Cantine Pellegrino. An easy to drink everyday red wine made from the native Nero d’Avola grape. From a clayey terroir yielding an intense red wine featuring scents of roses and red berries. Harmonium di Firriato is one of the best Sicilian Nero d’Avola wines produced by the assembly of three cru di Nero d'Avola. It is a tribute of love and respect for Nero d’Avola, Sicily’s greatest red grape, which achieves its climax in this interpretation. 2015 Cerasuolo di Vittoria from the recognized Sicilian producer Valle dell'Acate. A beautiful young Cerasuolo red wine – full-body, soft, velvety and fruity. “1607” Frappato a unique red wine from well renowned Avide Winery in Southern Sicily. A fresh, young and elegant wine from the local Sicilian Frappato grape. Fondirò vino rosso is a unique wine from the famous and innovative Sicilian wine producer Milazzo. It is made outside the appellation system in order to have the freedom to make a red wine extremely modern and unique according to Milazzo’s production philosophy. 2015 La Clarissa Syrah from the recognized Sicilian producer Rallo - successful example of a Sicilian wine made from a well-known international grape variety. A beautiful fresh and balanced organic red wine with a gentle spicy note. 2015 Il Manto Nero d'Avola from the recognized Sicilian producer Rallo. A beautiful fresh and fruity organic red wine made from Sicily’s most famous red grape - a great meal wine. Lamùri Nero d'Avola a beautiful red wine from the famous House of Tasca d'Almerita in Palermo. Lamùri (l’amore) reflects the same love that Tasca d’Almerita puts into the production of its wines. 2013 Il Tascante Nerello Mascalese - A top Etna red wine from the famous House of Tasca d'Almerita in Palermo - rich in tannic structure and aromatic intensity with mineral notes supported by a pleasant freshness. Ghiaia Nera Tascante a fine young Etna red wine from the famous House of Tasca d'Almerita in Palermo – a wine with soft tannins, good drinkability and freshness. 2010 Cygnus a beautiful red wine from the famous House of Tasca d'Almerita in Palermo - made from a selection of Nero d’Avola, cultivated on the high hills, and Cabernet Sauvignon grapes blended to fully express the potential, elegance and austerity of the Sicilian grape varieties. Perricone Guarnaccioa a unique red wine from the famous House of Tasca d'Almerita in Palermo - made from a selection of Perricone grapes from the historical San Lucio vineyard, which provided new vines to enable the making of this wine, rich in polyphenols and spicy aromas, evoking memories of an ancient wine tradition. 2011 Angheli Donnafugata from Sicilian top producer Donnafugata –an elegant soft red wine made from Merlot and Cabernet Sauvignon grapes, a wine with an international taste. Versatile character - an intriguing wine that can accompany the whole meal. Tancredi from famous Sicilian producer Donnafugata - a great wine with a Mediterranean character, produced from local and international grape varieties. A red wine that amazes with its pleasantness and elegance. 2012 Quater Vitis Rosso from famous top producer Firriato. A real Sicilian wine made from 4 different local grapes produced at 2 different Firriato wineries in Sicily. A red wine made in a modern international style. The Sàgana is a mature red wine from top producer Cusumano. A wine from the line dedicated to the local grapes - here the top Sicilian Nero d’Avola grape expressing the best of Sicily. An intense and vibrant wine, fine and endowed with the complexity that only the best vineyards can offer. 3 glasses in Gambero Rosso. The Noà is a mature true Super Sicilian red wine from top producer Cusumano -made from Cabernet Sauvignon, Nero d'Avola and Merlot grapes grown in Cusumano vineyards at various locations on Sicily. A complex, harmonious and warm wine. 2007 Ramione Rosso Sicilia DOC from ambitious and innovative Sicilian producer Baglio di Pianetto. An elegant mature red wine – a beautiful marriage between Nero d’Avola and Merlot. On the main street of Pozzallo on the south coast of Sicily, only a few steps from the eighteenth century and majestic Cabrera Tower, the main historical monument of the town and in the vicinity of the port of the city with daily ferry connections to Malta, you find the Enoteca Wine Bar Sapori Doc. Our Mission is to expand the knowledge and culture of wine in general, especially that of Sicily. The almost 1,000 Sicilian wine labels from the most prestigious wineries to the new and emerging ones to demonstrate our commitment to this.